We saw a lot many parents in every city looking for a quality Daycare & Preschool and they seemed frustrated because of the wrong description of the services and non-transparency of the care provider’s policy. Thus, making the search more time-consuming process and unhappy parents. In India, the problem of finding a quality childcare is massive, parents visit several centres before deciding on any centre and are concerned majorly safety, curriculum, hygiene, sanitation, activities, adult-child ratio, emergency procedure, distance, individuals interacting with child and lastly followed by budget and expenses making the search more exhaustible, stressful and time wearing . In addition, Mothers travel from website to group; groups to pages; pages to forums just to get a genuine feedback and review about the centers. Upon failing for the search of quality childcare and accessing a genuine feedback a parent, is forced to fetch a feedback from neighbors and grandparents, thus compromising with the future of child on early education and care. This is also one of the major cause of women leaving the job after having a baby with is has been a reason to gender index gap since many years in India. No legislation or legal policy and no licensing authority for center owners, further exploits the childcare sector. Lastly, increase in a number of several casualties, miss-happenings, injuries etc. happening in centers due to intolerance of certain benchmarks by the providers making parents more skeptical and frightened towards selecting a childcare for their little-loved ones. Such incidences further make hassle-free parenting a dream for parents to access. “Our vision is to bring standardization and quality across all the childcare centers in India." We promise to assure the same amenities and facilities and same awesomeness in every center on-boarded on our platform giving pre predictability to the parents searching for quality childcare centers. We believe “Every child is a different kind of a flower and is unique and has different requirements “. A good care provider for your neighbor might not be the best suggestion for your kid. A child’s early years are astonishingly important; It is proven by neuroscience research that 90% of the child’s brain growth occurs by the time a child is 5 years of age. 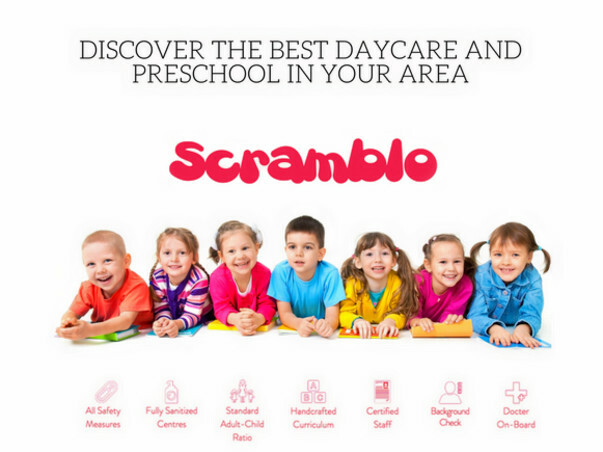 We at Scramblo are set to disrupt childcare industry in India and are looking for professionals who can breathe life into the Idea and deliver a product handcrafted with love. Scramblo is an online marketplace; precisely an ed tech startup with an intelligent discovery platform designed to change the way today million of parents access child care services. On an average, a parent spends 500 hours, a week's official leave, at least 8 to 10 applications, thousands on commute expenses and undergo lots of stress before finally deciding on a quality childcare. "Scramblo does it all for you from standardizing quality benchmarks of the providers to performing periodic checks, from accessing reviews and ratings to booking a slot." Scramblo does the work for you & instantly simplifies your search, compare centers and a lot more. So instead of searching for long hours and wasting too much of your effort, Scramblo makes it easy to find quality childcare. We are a young parent-centric organization, our team is on a mission to bring safe, nurturing and affordable childcare to every parent in India. The estimate above is for 6 months of Operations.